Their location makes for a great day trip from Moshi or Arusha. The Chagga is a tribe that inhabits the lower slopes of Mt. Kilimanjaro and the surrounding villages. Their location makes for a great day trip from Moshi or Arusha. The Chagga have assimilated into modern society in the cities well and hold many positions of leadership but they still keep many traditions in the small villages. There are many interesting stories about the Chagga and their religion, their existence during WW1, their wars against the Maasai. 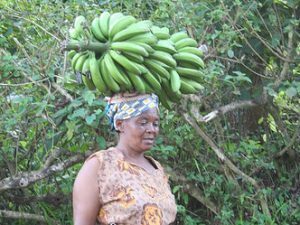 A visit to their banana and coffee plantations along with visiting one of the beautiful area waterfalls and surrounding rainforest, makes for a lovely and memorable day trip from Moshi or Arusha.